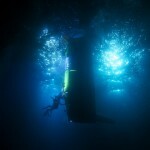 From decades of exploring oceans, I know that in big seas, launch and recovery is the riskiest part of the dive. If the sub swings out of control it’ll destroy itself, damage the ship, and turn the pilot into pink hash. In the case of the DEEPSEA CHALLENGER, you have to control a 12-ton object coming aboard a 2,000-ton ship. When the two are moving in opposite directions, there are some thick adrenaline moments. Last night, we steamed out of Sydney Harbour and turned south to Jervis Bay, about 155 miles (250 kilometers) along the coast. Our objective is to use this big, sea-protected bay to learn how to lower our 12-ton sub into the ocean and bring it safely back on board. Because this is a rehearsal, we have a “dummy sub” of steel and concrete. Today I watched as the crane operator lowered a large pelican hook at the end of a thick steel cable. 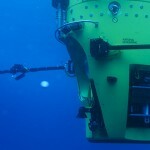 A man reached up and attached the hook to a red canvas lift sling in the center of the dummy sub. Four other lines were attached at its center and ends. As the sub was lifted slowly out of its cradle, men operating winches followed instructions from deck commander Dave Wotherspoon and kept every “tag” line taut. The crane operator lifted the sub high enough to clear the starboard bulwark and eased it slowly across the deck. The deck crew kept all four tag lines in tension, and the captain used the ship’s bow and stern thrusters to create an area of smooth water. As soon as the sub splashed into the ocean, Rich Robles steered a small black Zodiac toward it, and three divers slid into the water and released the lines. One of them vented the air from a lift bag and the sub became vertical. 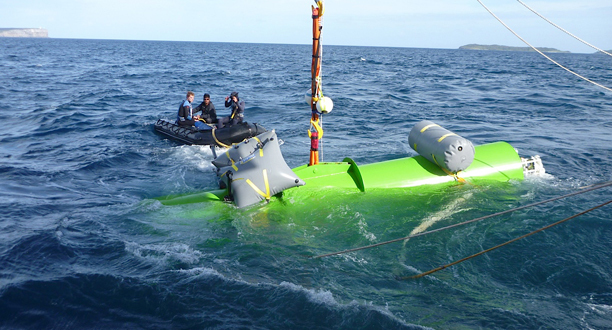 To recover the sub, the divers and deck crew did everything in reverse. After four trials, everyone agreed on one thing: We still have a lot to learn.